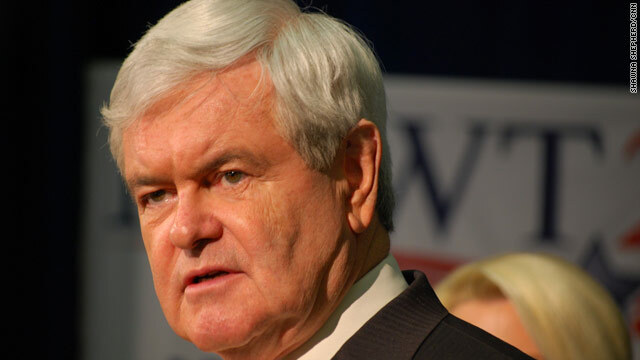 Charleston, South Carolina (CNN) - In what appears to be a last ditch attempt to halt Newt Gingrich's late momentum in South Carolina, a fake CNN Breaking News alert was emailed to state Republican activists early Thursday morning claiming that the former House Speaker pressured his ex-wife to have an abortion. CNN did not send out the email alert. It's not clear how many people received the fake email, though at least two members of the South Carolina GOP Executive Committee, who did not want to be named, were among those who found the missive in their inboxes this morning. Two South Carolina Republicans from different parts of the state independently informed CNN about the email on Friday morning. The email alert was sent from fake account made to look like a CNN breaking news email address: "BreakingNews@mail.cnn.com." "A source close to Marianne Gingrich tells CNN that former House Speaker Newt Gingrich forced her to abort a pregnancy conceived during the affair that preceeded her marriage to Gingrich," the fake email reads. Marianne Gingrich, who went public this week with charges that Gingrich once asked her for an "open marriage" while he was having an extramarital affair, has not made that claim. "An ABC News interview with the Speaker's ex-wife aired Thursday evening which detailed the candidate's request for an open marriage and their subsequent divorce," the fake email alert adds. Might not have been true, but sounds like something this bloob would do. What a slime. To those of you attacking Obama for what republicans are doing to republicans- GET A GRIP. This kind of thing is not funny and should be stopped. We should base our decisions on the facts that are there. It almost seems like something that happened to McCain during the 2000 election. So CNN won't take responsibility for it, eh? I heard a Christian Conservative on the radio stating something to the effect that The Bible teaches you forgiveness, which is why you see so many conservatives forging people for their past sins because it is what God wants and expects of us. I don't have a problem with that. It is the simple explanation for Catholic confessionals. But what does any of that really have to do with politics? First man tries to demogogue and impeach second man for allegded marital indescreitions. As it turns out, first man is not only committing marital indescretions of his own, but he is apparently committing *professional misconduct* of a criminal nature. Repeatedly to the tune of dozens and dozens of counts. First man is eventually forced to resign in utter disgrace. Wasn't the man bannded from serving again in Congress for life or something? And now you want to make this guy POTUS? Maybe. Or maybe CNN really did send it. CNN can't be trusted, at all, in politics. They are in bed with Obama. Naturally it's a democratic plot....what a laugh. This is GOP Rovian tactics at their best. And i assume you are including Fox News in your "neutural" reporting comment??? the first wife is the one who taught Newt how to cheat. She had a relationship with him when he was 16 years old.her being 26. All ethic charges were dropped against Newt. The second wife had an affair with a married man with three children before she met Newt. She then had an affair with Newt knowing he was the father of two girls. She apparently isn't opposed to "open Marriage. Awwww - sent by Newt so that he can further demonize the media and get the news out front so he can deny it while he's demonizing Cnn. I wonder if the Republicans would've been defending Obama if he had an affair or cheated on his wife or had multiple ex-wives? If you want ethics and morals, it's NOT SC, and it's NOT the GOP. Isn't this similar to what Rove did to McCain in 2000, passing it around that his adopted daughter from someplace like India was the result of an affair he had with an African American woman? If I had to venture a guess it has Rove written all over it. However, since Rove is also on Romney's side, I wouldn't put it past Romney either. He stayed clean while all that PAC money attacked Gingrich in Iowa. This is just ugly. But honestly it's what we've come to expect from the GOP. What are we turning into when your base has to be spoon fed this kind of toxic waste. Sad. I see Myth MorNEY and KARL ROVE and their SUPER PACs Thugs all over this email!!!! This has got David Axelrod wrote all over it! Okay, think back to Cain, look what they did to him. Have you heard anything about his so called affairs since he dropped out of the race? Now think back or go check out how obama got elected to the Illinios senate. You can almost bet that the dems had a hand in this and in Cains too. We need a fighter like Newt. @gi joe whats so wrong with demonizing cnn?cnn demonizes the tea party and fox news on a daily basis.now they know how it feels. Gingrich probably did this himself... Think about it. If he discredits it, then it makes his ex-wife entire story seem suspect. Then he can dismiss all "gotcha" surprises as fabricated targeted politics. Just like Rove did in his beginnings when he broke into his own office and blamed it on a democratic opponent. By the time the smoke cleared, he'd won. Karl Rove, Mitt Romney's shadowy Super-Pacs, the Nixon "Plumbers" or Newt Gingrich himself? They are all cut out of the same mold of sociopath! This is the embodiment of modern republicanism. Vile!